Do you take heartburn medication regularly? If so, did you know that one of the more popular heartburn medications could be secretly causing kidney damage? We’ve all been there: you ate a little too much, too quickly, and you pay the price with acid reflux (heartburn). Sometimes you don’t see it coming—maybe one of the ingredients that snuck in there triggered the heartburn, or maybe it’s a more regular problem based on overall diet. Whatever it is, when it strikes, it can be scary and highly irritating. Previous to this study, PPIs had also been linked to increased risk of bone fractures, pneumonia, C. difficile infection, low vitamin B12, and magnesium. What makes this so scary is that your kidneys are essential to your overall health, affecting every part of your body. Some potential complications of chronic kidney disease include fluid build-up, heart disease, seizures, and kidney failure. What’s possibly even scarier is that most people won’t notice damage until it’s already too late. Kidney disease is called a “silent disease” because the PPIs erode kidney function gradually over time, not quickly and aggressively. Long-term PPI use, in this case, can be highly dangerous. Of course there are natural, non-pharmaceutical ways to both prevent and treat acid reflux. You can start by improving your diet: greasy, fried foods and processed items are much more likely to trigger heartburn than healthier items that are unprocessed, nutritionally dense, and raw, baked, or steamed. I recommend vegetables, fruits, lean proteins, whole grains, and other unrefined, unprocessed options. You can also identify trigger items that can contribute to heartburn, like spices, and avoid them. Slowly drink a teaspoon of baking soda (sodium bicarbonate) in about eight ounces of water to limit heartburn. Chewing a stick of gum after eating can also help tame acid reflux. It stimulates saliva production and encourages swallowing, which clears the throat of irritants. Just don’t overload on the sugar-heavy kinds of gum. 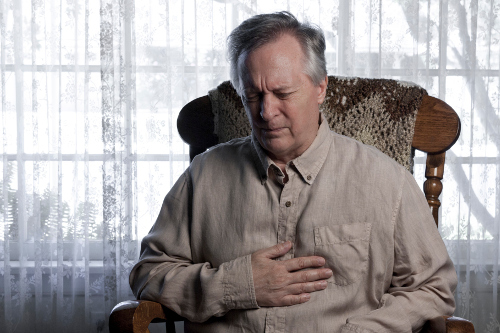 When you eat too quickly, it’s likely you’ll experience acid reflux afterwards. Take your time at meals and you might find some relief from heartburn. If you want to avoid or get rid of heartburn, standing up after a meal can help, too. If you experience heartburn in bed at night, there is data that suggest sleeping on your left side can help tame it. Hol, D., “Popular heartburn drugs could lead to kidney damage without warning: study,” CBC, February 22, 2017; http://www.cbc.ca/news/health/heartburn-drugs-kidney-damage-1.3994789, last accessed February 24, 2017. Xie, Y., “Long-term kidney outcomes among users of proton pump inhibitors without intervening acute kidney injury,” Kidney International, DOI: http://dx.doi.org/10.1016/j.kint.2016.12.021, last accessed February 24, 2017. O’Connor, A., “The Claim: Lying on Your Left Side Eases Heartburn,” The New York Times, October 25, 2010; http://www.nytimes.com/2010/10/26/health/26really.html, last accessed February 24, 2017. “Eating Food Too Fast Speeds Heartburn,” WebMD; http://www.webmd.com/heartburn-gerd/news/20030523/eating-food-too-fast-speeds-heartburn, last accessed February 24, 2017.